ONLINE BOOKING DISABLED - CALL FOR AVAIBILITY/RESERVATIONS AT OUR 6,000 Sq Ft FACILITY - 541-647-4433 - 10' 10" Stand Up Paddle Boards are for speed and maneuverability on any of many local lakes and the Deschutes River. Paddle down with current, or paddle up river. Leash provided on request. Bow open storage area. Three fin system for extra control. May add seat at no charge on request. Recommended maximum novice weight ; 199 Pounds. For weights in excess of this load recommendation, we have SUPs rated up to 352 pounds (SPK-4 & Racing Board). An inflatable SUP board is a great choice if you are looking for convenience and portability. 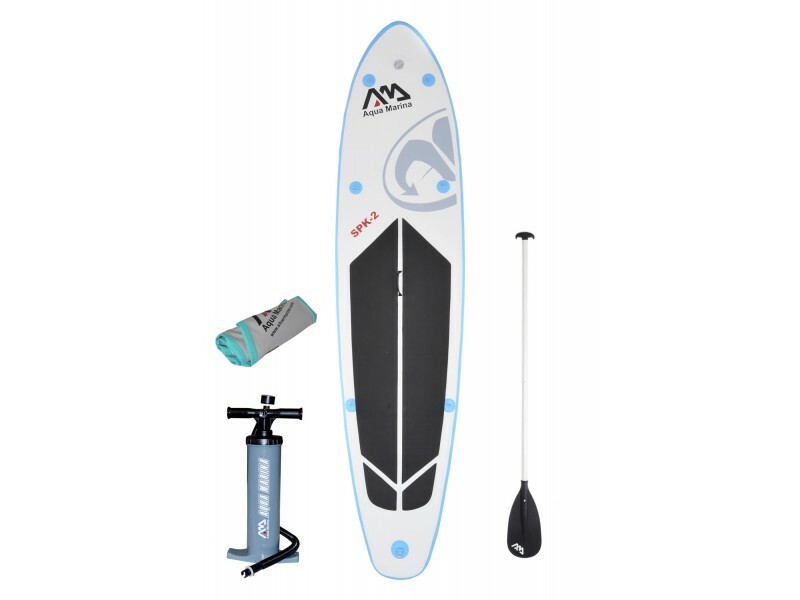 The Aqua Marina SPK-2 Inflatable SUP Stand Up Paddle Board and 3PC w/Paddle 10' 10" is lightweight, durable, and fun to paddle! It has a tri-fin set up and the 7 stainless steel D-rings and elastic bungie cords will help keep cargo in reach. The PVC construction is commercial grade and super strong. The anti-slip deck pad is large and will help keep you upright. This board is rigid and feels like a hard board when inflated and the three fin set up is great for paddling on flat water. Made from commercial grade PVC with strong drop stitch construction, the SPK-2 inflatable SUP board is 10'10" long, 30" wide and 4" thick when inflated. The recommended novice weight is 199. Maximum capacity is 255 lbs. The big deck pad is designed to keep you on your feet. The three fins set up tracks well on flat water. The SPK-2 is the perfect inflatable SUP board for lakes, rivers, the ocean, fun and fitness! Fold the SPK-1, collapse its adjustable paddle, and put everything in the handy carry bag, or put in the trunk to return it to ToyHouse..